The town of Siem Reap is located in northern Cambodia and is the main gateway to the famous Angkor Archaeological Park and Angkor Wat. The town is a tourist haven and there are plenty of amenities around, including restaurants, bars, and affordable accommodation. There are a few traditional backpacker style hostels, but most budget guesthouses cost about the same as a hostel and offer a slightly higher quality room. Although prices remain quite low by western standards, Siem Reap is significantly more expensive than other towns in Cambodia. If you're traveling during the low season, your best option may be to arrange accommodation after you arrive. There are typically plenty of rooms available and you can often negotiate a lower price. Like elsewhere in Southeast Asia, there is a constant turnover of guesthouses. For the most reliable recommendations, it is best to ask other travelers on the road where they stayed. If you want to make reservations in advance, the hostels below are usually listed on booking websites and are generally reliable. 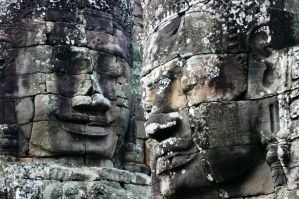 How much do hostels in Siem Reap cost? 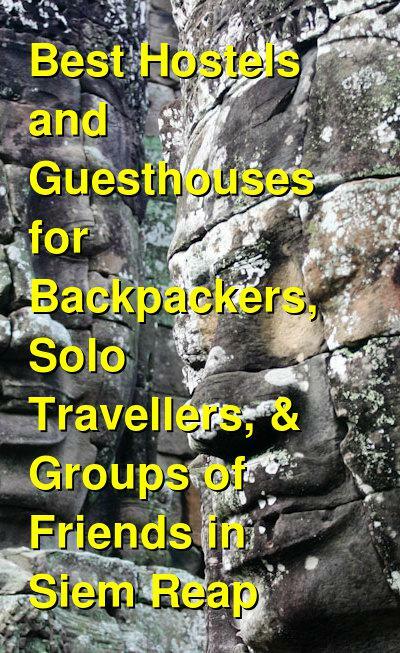 A good hostel for backpackers, solo travellers, and groups of friends. If you're looking for a true hostel experience, then the Siem Reap Hostel is likely one of your best options. It's owned by Australians and Cambodians, and it has been built from the ground up specifically to be a hostel. The hostel has some wonderful amenities available including a pool and poolside bar, a restaurant, and several great common areas. There's a social atmosphere and it's easy to meet other guests. If you want some space to yourself, that's not hard to find either. The hostel is conveniently located about a five minute walk from the Old Market and Pub Street. They offer the standard amenities including free wi-fi, air conditioning, hot showers, and modern rooms. They can also offer pickup from the airport, bus, or boat stations. The hostel's shared bathrooms are a bit rough, so it's better to stay in a room with ensuite bathrooms. There are both private rooms and dorms available and private rooms are either doubles or three bed rooms. Dorms sleep either six or eighteen people depending on your budget and travel preference. Female only six bed dorms are available as well. Breakfast is included in the price of a private room and can be purchased if you're in a dorm. Sam So Guesthouse is another popular option with backpackers and budget travelers. It feels a bit more like a hotel than a hostel but it is affordable. It's a family owned guesthouse and the staff are knowledgeable and helpful. The guesthouse has a relaxed atmosphere where you can be assured a good nights sleep. There are 19 rooms in total and guests can choose from rooms with fans or air conditioning depending on their travel style and budget. There are a wide variety of private rooms available including singles, twins, doubles, and three bed rooms. The basic rooms have fans and a bathroom with a cold water shower. The standard rooms have air conditioning and a bathroom with hot water showers. Breakfast is also included in the standard room rate. The guesthouse offers free pick up from the bus station, airport, or pier, but you do have to notify the staff in advance of your arrival. If you're looking for a reliable and comfortable place to stay in Siem Reap that isn't too expensive, then this is a good option. A good hostel for backpackers and small groups of friends. Central Hostel is another good option for backpackers and budget travelers. The atmosphere can be a bit hit or miss, depending on the crowd that's staying there. There are affordable dorm rooms available that sleep up to six people, and there are private rooms that include singles, twins, doubles, and three bed rooms. The hostel is not too far from the Old Market, the Night Market, and Pub Street. There's a nice lobby area and a common room where guests can hang out. There's also a swimming pool that's a bit small but still refreshing. The rooms have air conditioning and each bed has its own safety box where guests can store their valuables. The staff here can also help you with any tours, activities, or transportation you might need. The prices are a bit higher than you might find at a travel agency, so it is always a good idea to shop around before booking.